St Kiaran's Church stands on the inland side of the main road running along Loch Indaal some three quarters of a mile north of the village of Port Charlotte. Today it is one of two active Church of Scotland churches which serve the Rhinns of Islay. The other is Portnahaven Parish Church, and the two share a Minister. Islay's population peaked at over 15,000 in 1841, but had dropped to fewer than half that number by the end of the century through clearance and emigration. Over the same period, and subsequently, the patterns of settlement also changed dramatically. In the 1800s the parish covering northern and north western Islay was known as "Kilchoman and Kilchiaran", and the focus of worship was the large and long established church at Kilchoman near the north west coast. The development of distilleries on the Loch Indaal side of the Rhinns of Islay and of the village of Port Charlotte meant that an increasingly large proportion of the population lived on this side of the peninsula. 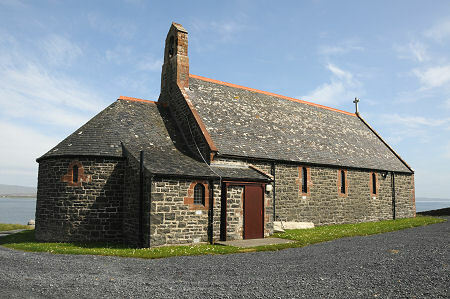 St Kiaran's Church was built in 1897 to provide a place of worship in a location more convenient for the parishioners. The church was planned by Peter MacGregor Chalmers, a Glasgow architect known for his many churches across Scotland, and for his work on the restorations of Iona Abbey and Paisley Abbey. The dedication to St Kiaran continues the tradition of the medieval Kilchiaran Chapel, whose ruins remain on the opposite side of the Rhinns. In 1977, St Kiaran's became the parish church and Kilchoman Church, by this time standing in an almost totally depopulated part of the island, was abandoned. The churchyard at Kilchoman remained in use, however, which is why there isn't one at St Kiaran's. St Kiaran's is aligned almost north-south. Romanesque in style, like many of its architect's churches, its grey stone exterior is nicely offset by the red sandstone dressings around the windows and gables. The drive leads up to a large car park behind the church, but for casual visitors it is possible to pull off the road, from where it is only a short walk up the path to the main door. 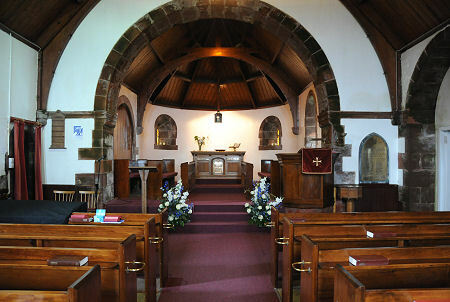 The interior is divided into a nave and a chancel by a semicircular sandstone chancel arch. The transept on the east side of the church was originally accessed by two similar arches, though these are now blocked off. The walls are white, which nicely offsets the dark wood of the furniture and the roof. The focus of the interior is very much its northern end and the chancel. 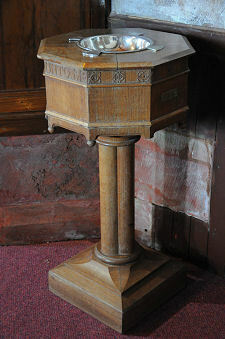 Just within the nave are the pulpit and font, while the chancel itself is home to the communion table. 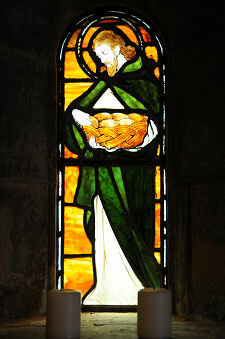 Also in the chancel are two small stained glass windows. These depict elements of the communion. Once shows Christ with a chalice; while the other shows him carrying loaves. The overall result is a church with a nicely welcoming feel, and one which though built for the Church of Scotland harks back strongly to pre-Reformation church architecture.